Fence professionals in and around the Chicago area can register now for three days of networking, exhibits, education and more at the Hilton Rosemont / Chicago O’Hare Hotel in Chicago, Illinois, September 14-16, 2017. Our North Central Regional Conference is a great chance to build industry connections and further your career with continuing education and certification. Keep reading for more details about what we have planned. REGISTRATION IS NOW OPEN! Click here to register. Where else can you attend one of four schools that provides classroom and hands-on training? This is what sets AFA University apart from similar training programs. Scheduled November 5-10, 2017, AFA University will feature: •	Operator Installer School (OIS) -- celebrating 10 years! 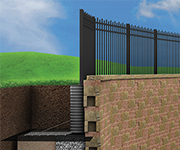 •	Automated Gate System Design School (AGSD) •	Fence Installation School (FIS) •	Sales Training School (STS) •	Certification Exams (CFP, CAGOI, CAGSD) •	and more Training is ideal for fence professionals at all experience levels. If you are seeking to gain or improve your technical skills, advance your career, and build a network of professionals, AFA University is for you. 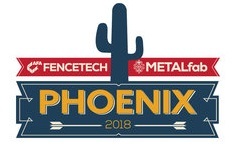 Save the date for FENCETECH 2018 in sunny Phoenix, Arizona! FENCETECH will feature top-notch education, technology, networking opportunities and exhibitors for the best trade show in the industry. You will not want to miss this event, February 6-9, 2018. Room blocks and registration will open at the end of the summer. We hope Reno is ready because the CFCA Chapter is coming for a three-day golf tournament and auction September 14-17. Our event will be full of laughter, good times, and delicious food. To register please contact Janeekilgore@gmail.com. The Colorado Chapter of the AFA has planned the rest of 2017 with three more incredible events you will not want to miss. On August 26, join our chapter for a fun and competitive Sporting Clays tournament at Colorado Clay Shoot. After you mark this date on your calendar, reserve October 20 for a Bocce Ball Tournament and December 2 for the annual holiday party at TopGolf! For more information and questions, please reach out to Sandra Tucker at info@coloradofenceassociation.com. To better serve the Florida region for our AFA members, a new Chapter has been established and we need your involvement to make a difference in our industry. The Florida Fence Association has held one planning meeting in Orlando and the next planning meeting will be held on Thursday, September 21, 2017 in Orlando at the Holiday Inn & Suites across from Universal Orlando. This upcoming meeting will establish a Chapter Board and Chapter Committees. 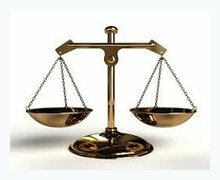 To support the revitalization of the Florida region and support the members, we hope and encourage your involvement. RSVP to Nick Rike at nrike@jamiesonfence.com or call 407-745-5247 office, 937-305-4984 cell. It is never too early to get in the holiday spirit! Mark your calendar for December 2 in New Orleans for the Gulf South Chapter Annual Holiday Meeting and Celebration at Pat O’Brien’s. you will not want to miss this exciting event on Bourbon Street. 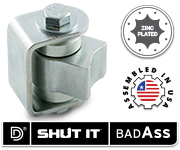 Reach out to Jennifer Palmer, jennifer@calhounfenceinc.com, for questions and registration. Castaways Animal Shelter will be the recipient of the 2017 Midwest Chapter project, please join us on July 29 in Chanute, Kansas for a family affair to help with 500’ of fence! Bring your fence pliers and favorite tools and share how you do things with us all. Call President, Barry Baker, with any questions at 316-390-6668. Join the Midwest Chapter for the ultimate stay and play destination at the Shangri-La Resort in Monkey Island, Oklahoma. Located on the shores of beautiful Grand Lake O’ The Cherokees on September 15-16 will be a weekend of golf, networking, and fun for everyone. Call President Barry Baker, with any questions at 316-390-6668. The North Central Fence Chapter 17th Annual Golf Outing is coming up on August 10 in Stillwater, Minnesota. Get your clubs ready and shine your shoes, this will a 4-person best ball tournament that will be guaranteed fun. For registration and questions, please contact Bob Peterson at bobp@midwestfenceco.com. Get ready for a great golf outing at the Connecticut National Golf Club on August 25 with the Northeast Chapter of the AFA. Registration and sponsorship opportunities are now open, contact President, Kim Miller at kmiller@millerfence.com. Mark your calendars for the remaining chapter events for the 2017 year! Get your shotguns ready, the Northern Ohio Chapter is hosting a sporting clay shoot on September 13 in Medina, Ohio. After the tournament, there will be a steak dinner for all that register. For more information and questions, please contact Ken Throckmorton at 330-321-5522 or foreverfencerail@yahoo.com or Tom Polen at tom@elyriafence.com. "Semiahmoo Resort" isn’t just fun to say; it’s an amazing destination with spectacular gourmet dining, sparkling outdoor pool, full-service spa, and award-winning golf. Join us there on August 17-20 for networking that’s such a good time, you’ll forget you’re making important professional contacts. If you’re interested in sponsorship or event details, please call Brad Howard (916.257.6707) or Dave Cochenour (360.601.0649). Hope to see you in Semiahmoo! The TFA golf tournament is getting closer and "The Bill Turner Cup" is up for grabs! On September 29-30 in Fort Worth the Texas Chapter will be teeing off for their golf tournament fundraiser and rolling the dice at the casino themed party at the Hilton on Friday night. 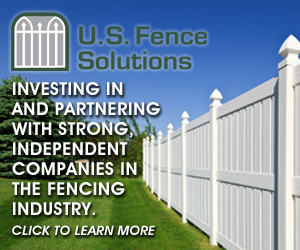 For more information, please reach out to Vice President, Sean Cooper at cooper@alliedfencedallas.com. 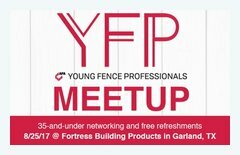 AFA’s Young Fence Professionals (YFP) are hosting a free networking happy hour for the fence industry and beyond. Join us to talk shop, trade cards and clink glasses from 1:30-6:30 p.m. on August 25, 2017 at Fortress Building Products, 1720 North 1st Street, Garland, Texas 75040. Anyone 35 and under is welcome: members of AFA, IDA, and NOMMA, plus interested non-members too. Register yourself now and spread the word! Your digital edition of the latest issue of Fencepost is available for your reading pleasure.This issue includes a focus on safety, an article on cedar fencing, expert insight into SEO factors that can boost your website's ratings, and much more. Start reading today! Did you know that the Member Savings Program can potentially save you thousands of dollars and help lower your overhead costs? Watch this short video to learn a little more about the MSP and don’t hesitate in reaching out to Mark at mark@membersavingsprogram.com to start saving money today! THE AFA WOULD LIKE TO WELCOME THE NEWEST MEMBERS TO OUR FAMILY! WE WOULD LIKE TO RECOGNIZE OUR MOST RECENT RENEWED MEMBER COMPANIES FOR THEIR CONTINUED SUPPORT AND DEDICATION TO THE INDUSTRY!